What is ODIS Engineering Software? ODIS Engineering (Offboard Diagnostic Information System Engineering) is engineering software for work VAG cars of group (Audi,Seat,VW,Porsche). The Offboard Diagnostic Information System Engineering software is the program that provides you with an interface that complies with SAE J2534 (diagnostic interface). 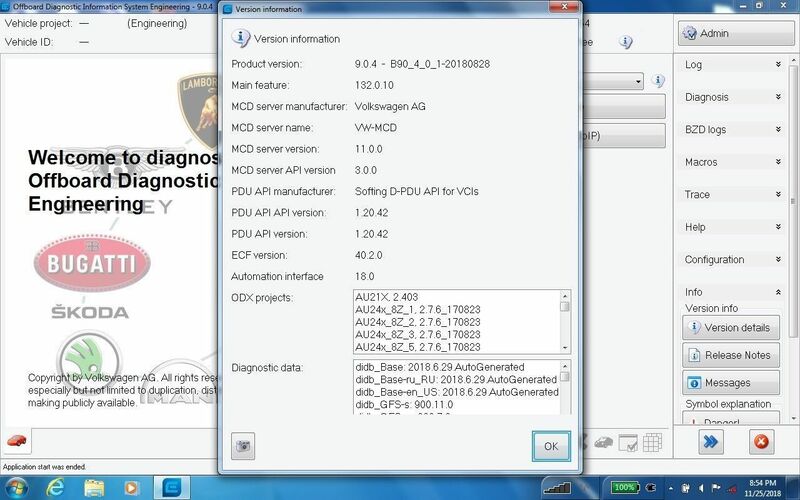 This software enables you to diagnose, code and offline Flash all Volkswagen, Audi, Skoda, Seat, Bentley and Lamborghini brand vehicles. The complete ODIS Engineering 9.0.4 requires at least AMD or Intel Celeron/Pentium CPU 1.5 GHz, 2 GB RAM, 30 GB free HDD space, USB 1.1 port (USB 2.0 recommended) and suitable Microsoft Windows platform with the latest service pack installed. English (GB), English (US), French (FR), German (DE), Spanish (ES), Russian (RU), Greek (GR), Danish (DK), Croatian (HR), Italian (I), Hungarian (HU), Netherlands (NL), Polish (PL), Portugal (PT), Korean (KO), Slovenian (SLO), Finish (FI), Swedish (SE), Turkish (TR), Czech (CZ), Japanese (JP), Chinese (CN). MIND – able to install till 5 languages together.